Last year we made our very first batches of freezer jam. Raspberry. Strawberry. Blackberry. Blueberry–Nectarine. 35 jars total and we are now down to 3. Well now, the berries are here again! We have been taking full advantage of berry season whether it is at the grocery store snatching up a 1/2 flat of Skagit Valley berries or at the Farmer’s Market eating up delicious Tri-star and Seascape strawberries that we just can’t seem to get enough of in those little hands and mouths that I adore. In years past, I have grabbed blackberries from our “berry orchard” (read: wild berries) at the end of our driveway and frozen a few gallon bags for over the winter. We are such berry lovers that they are always gone by mid-December and I am always promising myself we will gather more “next year”. Throughout the years, I had always been envious of the families that served fresh berry preserves the whole year through while I was buying jar after jar at the store. Growing up in So Cal didn’t include spending summer days making jam, so I never had it in my repertoire of skills and figured it was beyond me…the same was true with vegetable gardening. Since I tackled the later with a garden for four, I figured I could dive into jam (doesn’t that sound fabulous?). My one reservation was dealing with a huge boiling pot of water and hot jars while I have a curious 5-year-old and a VERY squirmy almost 2-year-old who, um, interact a lot these days. Last summer, one of my dear friends was raving about freezer jam. “It is SOOOOO easy”. She is sooooo right! Here is the recipe I used and the Lil Man could help. No heat! I imagine this would be wonderful for those of you who live in places where the temps are soaring as well. Let’s talk safety for a moment. First and foremost, make sure your jars and lids are CLEAN. I like to throw mine in the dishwasher on the “sterilize” cycle right before I use them. If this is not an option, place them in boiling water for 5 minutes and then place them in a clean dish rack to cool. this method will allow the jars to be held in the fridge for a couple of weeks or in your freezer for up to a year. Once you open the jar, use it within two weeks. In addition, this method will not kill E. coli. Make sure you wash and sort your fruit well. A note about the recipe. As I looked at various recipes online and in my 4 preserving books (yes, I have them and read them. I just haven’t dove into the process yet, but I am getting there). I liked this recipe because it had considerably less sugar in it. This is the recipe on the Ball Real Pectin container. It is a keeper and alterations are highly frowned upon when making anything in a jar that you are going to keep over time. Trust the professionals. Also, I highly suggest buying the batch container. You can make as much or as little as you want at a time and save the rest for later. Good thinking Ball! Helpful Supplies: Potato masher or hand mixer (the hand mixer is GREAT for the blueberries) and a flat-bottomed bowl for mashing / mixing fruit. Wash fruit and prep. This means remove stems, hull strawberries - if you want to get technical. Make those berries look pretty. In a separate bowl, mix sugar and pectin. Add fruit mash to pectin/sugar mixture and stir for 3 minutes. Ladle into clean 8 oz jam jars and cover. When filling jars, leaving 1/2 inch headspace to allow for food expansion during freezing. Let stand for 30 minutes and use immediately or freeze. THAT IS IT!!! DONE! BERRY JAM!! It is good for 3 weeks in your refrigerator or up to a year in your freezer. To defrost, just throw 'er in the fridge. Really, that is it. Now for the taste test…. EASY PEASY!!! Now it is your turn. Try it out. Seriously, you can do this! The taste of this jam will make it so you never buy a jar of jam again. Fruit from a local farm. Jam made in YOUR kitchen. Low sugar. Save a ton of money. Incredible over-the-top “Mom this tastes like our yummy strawberries from the garden” flavor. Are you sold yet? Now you can do make freezer jam with Strawberries, Peaches or Pears, Raspberries, Blackberries, Blueberries or Cherries. If you use peaches, add 3 tablespoons of lemon juice to prevent browning (Ew!). Is it possible? Yes. As you gather that amazing fruit in flats over the summer. Clean it, process it, freeze it. Then when you need some jam, make a few jars. No need to have 40 jars filling up your freezer (or to HAVE 40 jars for that matter). 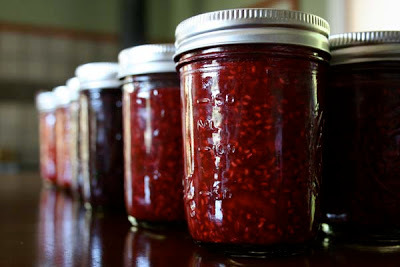 Now that you will be cranking out dozens of jars, what are some other ideas for your berry jam?